Myopia Control | Dr Kisling Fort Collins,CO. Myopia control is going to be a huge part of eyecare in the not so distant future. The National Eye Institute found a 66% increase in myopia (nearsightedness) between the early 70’s and 30 years later. In 2008 it was estimated that 42 percent of the population was myopic. Some countries in Asia are reporting up to 80% of the population has become myopic. There does seem to be a correlation with higher education and the amount of time spent in school. German researchers found that 24% of students who did not graduate from high school were myopic versus 53% of college graduates. The more myopia in the population, the larger the number of people with very high myopia becomes. And very large amounts of myopia are linked to vision loss from retinal detachments, cataracts, glaucoma, and degeneration of central vision. There is definitely justification in using what methods we have available to try and lessen the development of myopia in children. Soft Multifocal Contact Lenses can be used to slow the progression of nearsightedness. 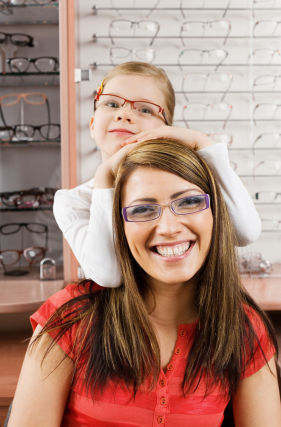 One recent study found a 50% reduction in the rate of increase in myopia. A multifocal contact lens was used with a central zone set for distance vision surrounded by a ring of near vision. The defocus created in the periphery of the contact lens pushes the eye to try and compensate, reducing the drive towards myopia. Rigid Gas Permeable Contact Lenses Fit as Ortho-K can be used to act like a retainer used for teeth. This type of lens design directs the front tissue on the eye (cornea) to flatten out more. It also lessens the elongation of the eye over time thus decreasing the amount of myopia developed. Overall the reductions reported in change run from 30% to stabilization. Eyedrops of Weak Concentrations of Atropine have been used overnight in children and reportedly lessen the amount of myopia by up to 75%. While this is being used fairly widely in certain regions of Asia, it is still uncommon in the U.S. and the weaker form of atropine drops are not commercially available, requiring special compounding. In the past, the effect was thought to be due to an interference in focusing for near, today the mechanism is thought to be unknown. Multifocal Eyeglasses for Myopia Control have been found to be ineffective in most studies. There is a small segment of the population where they may have minor effects in reducing myopia. There are insufficient studies to say for sure what works and how well it works. It is reasonable to try and lessen the rate of progression of nearsightedness with what we do know. Soft multifocal lenses are probably the most readily accepted method by kids, and there is a good chance they will help. The future looks bright to help lessen the impact of myopia on upcoming generations of youth.